New Orleans Uber is the canary in the coal mine. After years of listening to the reports that held up Uber as the herald of the future, creating a new business model where an application would substitute for an employer, the accounting is finally coming due. Its drivers were touted as the vanguard of the gig economy, complete with claims that this was what the “new” worker really wanted from employment. Now it turns out Uber may be the canary dying in that coal mine because the Achilles heel of the gig economy is increasingly revealed: it’s not sustainable. No matter what Uber and others want to call them, they depend on workers, and workers are voting with their feet that they can’t make it on temporary work, so they have to keep moving, and that means working for another company. The gig economy doesn’t work when people can’t make a living on Uber and similar gigs. Wow! I’ll guarantee you, because I know many once upon a time Uber and Lyft drivers that join on the promise of higher wages, and they leave when they finally realize that paying for gas, their car, insurance, and then looking at their pay, it just doesn’t add up. 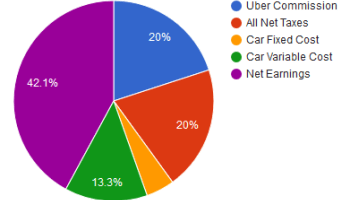 Uber is stuck on a business model that is based on exploitation of workers, that business model, like most of the vaunted “gig economy” is unsustainable, because workers fooled at first, are not fooled forever when it comes to the empty pay envelope. Uber and the rest of these companies are not a new model, but an old one. They are labor contractors trying to sweat workers with a new tool, but an old scam. This is a piece rate scheme. Some workers can make it, but most can’t. Worse, all of these companies are pushing off their responsibilities as employers to provide social security, unemployment and even bare bones benefits, but making the workers who are their lifeblood into subcontract labor. In Europe and some US cities, that part of the hustle is also falling apart as Uber is increasingly declared an employer. Workers are being gigged by this model. The canary is dying in red ink. A business model that depends on exploiting workers is doomed, even if it takes some time to die. This entry was posted in Citizen Wealth, Financial Justice and tagged gig economy, jobs, minimum wage, Uber by Wade. Bookmark the permalink.